The Barrow Boys' gypsy wanderings around Victoria took them on quite the trip for this collab with Blackman's. It started with Barrow Boys brewer Ash heaving north to Rostrevor Hop Farm to smuggle out 20kg of fresh Galaxy hops, at which point he hit the road for the Surf Coast. The reason being that he and Renn Blackman had pledged to brew a wet hop beer together while at Ballarat Beer Festival. Both being lager lovers, they'd come up with a recipe for a red bock and figured Galaxy would give them the citrus aroma they were after. Within 24 hours of collecting the hops, they were being loaded into a makeshift hopback [which allows the hops to be added to the brew post-boil so a brewer can extract predominantly aroma and flavour rather than bitterness] at Blackman's Torquay brewery. 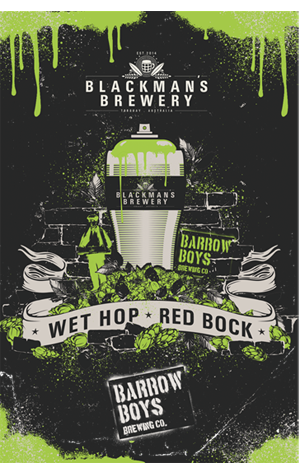 The result is a beer they tell us is red in colour, has "subtle caramel from the malt" and a "distinct floral aroma and layers of melon, passionfruit" from the wet hops.